Biden says Israel must accept nuclear Iran! Biden has historically been a strong ally of Israel, so this comment may turn out to be apocryphal. If, however, it turns out to be true, there will be some slippage of support among voters who count themselves strong supporters of Israel. Democratic vice-presidential candidate Joe Biden was quoted Monday as telling senior Israeli officials behind closed doors that the Jewish state will have to reconcile itself to a nuclear Iran. Obama Daily Change Watch: “Poor Phrasing” on “undivided” Jerusalem. Okay, AIPAC, here’s another parsing of Obama’s comments to you regarding an “undivided” Jerusalem. IMO, that’s not as good an applause line as the original! I have been scouring the news for any follow-up articles on the “Stone Scroll” or “Gabriel’s Revelation” as it has been called and haven’t found much that advances the arguments that have already been made. I did, however, stumble across this piece this morning in IsraelToday.com and thought it worth posting. The unique stone tablet dubbed “Gabriel’s Revelation” contains 87 partial lines of archaic Hebrew in which the archangel commands a messianic ruler identified as the “Prince of Princes” to rise after having been dead for three days. The tablet was found in neighboring Jordan some eight years ago, but just last week gained international attention after featuring as one of the centerpieces at a special Israel Museum event marking 60 years since the discovery of the Dead Sea Scrolls. The content of the tablet quickly made headlines after a leading Israeli professor of Bible studies, Israel Knohl of the Hebrew University, spoke of his conclusions regarding the script. In an interview with the International Herald Tribune, Knohl called the text “revolutionary” in its confirmation that Messiah suffering and dying was originally a Jewish concept. Before the NY Times article on the Stone Scroll appeared on Sunday, Ada Yardeni herself (the specialist in Hebrew writing who recognized the importance of Jeselsohn ‘s stone tablet) published an article in the Jan/Feb 2008 Biblical Archaeology Review entitled “A New Dead Sea Scroll in Stone?”. Here’s an excerpt. Read the whole thing, it’s quite interesting! And the letters that have survived are often very hard to read. The back of the stone is rough and unfinished, unlike the polished side with script. This suggests that the stone was once mounted in a wall. Whether it was inscribed with the stone already mounted in the wall or lying flat on the floor, it must have been very inconvenient to write on the polished side and this may well account for the rather careless look of the script, which was nevertheless the work of a professional scribe. The text has not been identified, but it is clearly a literary composition, similar to Biblical prophecies. It is written in the first person, perhaps by someone named Gabriel (“I Gabriel,” line 77), so I have named the text “Gabriel’s Vision.” It is apparently a collection of short prophecies addressed to someone in the second person. Like the prophets of old, whoever wrote this composition proclaims the “word of Yahweh,” the personal name of the Hebrew God. And, again like the Bible, many of the prophecies open with the words “Thus (or therefore) said the Lord [that is, Yahweh and sometimes the more generic Elohim] of Hosts.” Sometimes the text uses Elohei Yisrael, “God of Israel.” There are also numerous references to Yahweh’s kavod, or glory, familiar to all students of the Hebrew Bible. UPDATE 7/7/2008 at 2:28pm EST: Here is a link to an English translation of the “Gabriel’s Revelation” stone at the Biblical Archaeology Review—English translation (in Microsoft Word). I have also posted the English translation (from Biblical Archaeology Review) in comments below. This stone tablet, which contains writings dated to the decades before the birth of Christ, is thought by serious scholars of the subject to be a significant discovery. The tablet itself is not a new discovery–it was purchased 10 years ago from a Jordanian dealer in antiquities by an Israeli/Swiss collector who, while himself an expert on Hebrew antiquities, was unaware of its importance until recently when it was shown to Ada Yardeni, a specialist in Hebrew writing. Read the article in today’s NY Times or in the Times Argus (Montpelier/Barre, Vermont). 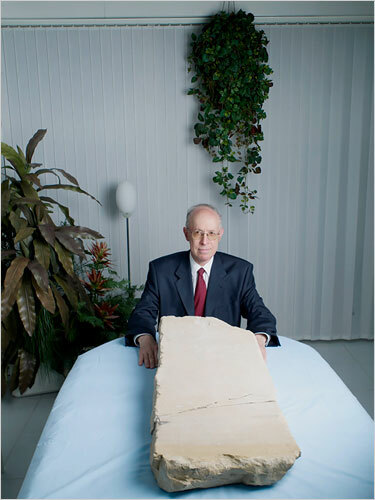 David Jeselsohn and the tablet. Obama is most brazen liar to come onto the national stage since…well…Slick Willie and wife. He is the candidate of Change (his position) and Hope (you didn’t notice). God bless our poor country if it is so naive as to elect this charlatan. Or to paraphrase Jeremiah Wright…”America will be damned” if Obama becomes our President. Saddam awarded Pali suicide bombers’ families handsomely! Invasion of Iraq a blunder, Obama? For those of us who forget about the reasons we deposed Saddam, let’s look back to what he was doing prior to the U.S.invasion in 2003. One of the many ways Saddam Hussein (“Hussein”…that rings a bell somehow) was supporting terrorism (against Israel, in this case) was by awarding the surviving families of Hamas suicide bombers $25,000 apiece. Families of militants who were killed in the general fighting against Israel or the families of Palestinians who were killed as part of collateral damage of responding Israeli operations were awarded $10,000. The Palestinian Arab Liberation Front (PALF) stated that up to $35 million had been paid out prior to the invasion of Iraq in 2003 (since 2000). BTW, keep in mind that $25,000 (or $10,000 for that matter) is a small fortune to the families of Pali terrorists. This is a good reminder to Israel of just how Obama supports her yet curiously believes the invasion of Iraq was a “blunder.” Israel should remind herself how many more citizens would have died at the hands of suicide bombers had these payments not ceased!